When I create anything artistic, I feel good. I’ve also noticed that my life goes better… I attract more good things into my life. So, when Bob Proctor sent me this quotation this morning, I knew I wanted to turn it into a mini-poster and put it on my wall. “It’s really important that you feel good. 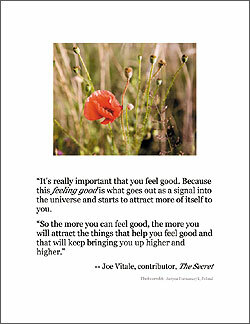 Because this feeling good is what goes out as a signal into the universe and starts to attract more of itself to you. Of course, that summarizes The Secret in three sentences. However, whether or not you believe in The Secret, this is still a happy way to look at life and the world around you. It’s empowering, on a deeply spiritual level… and isn’t that what creating and art are all about? Next Next post: SketchCrawl Inc.?